ECHINODERMATA : DENDROCHIROTIDA : Phyllophoridae STARFISH, SEA URCHINS, ETC. 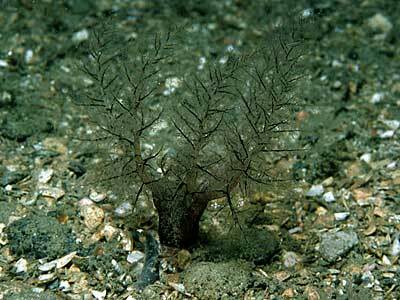 Description: This species has finely-branched tentacles with white main axes and black side branches. The body is brown with longitudinal dark streaks and is covered with long, hairy tube-feet. There are no spicules except in the tube-feet and tentacles. Up to 15cm in length. Habitat: Usually lives amongst boulders in sheltered habitats, buried in mud or sand between the boulders. May also occur in mud, amongst horse mussels and with Thyone fusus. Similar Species: Several Thyone species are very similar and some names could turn out to be synonyms. Tentacles with white main axes and black side branches. Habitat in mud between boulders. Spicules absent except in tail and tentacles. Picton, B.E. & Morrow, C.C. (2016). Thyone roscovita Hérouard, 1889. [In] Encyclopedia of Marine Life of Britain and Ireland.